Actor Shabana Azmi criticised the censor board as well as Smriti Irani over Padmavati issue. Within hours of the Central Board of Film Certification (CBFC) or the censor board informing the Padmavati producers that their application for certification had been found to be "incomplete", actor and social activist Shabana Azmi took to Twitter to question the intention of the board. 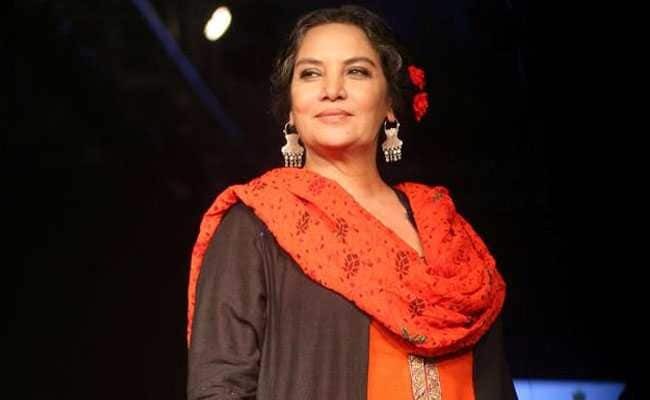 In a series of tweets, Ms Azmi also demanded "action against those issuing threats" to the cast and crew of the upcoming Hindi film by filmmaker Sanjay Leela Bhansali and reminded the censor board that "it is (a) statutory body mandated to classify the film". Calling the situation "cultural annihilation", the 67-year-old actor criticised Information and Broadcasting Minister Smriti Irani for her silence on the issue. "Smriti Irani is preparing IFFI dats possible only bcoz the Indian Film Industry brings such acclaim to it but keeps quiet about Padmavati!" In another tweet, she requested the entire film industry to boycott the International Film Festival of India (IFFI) in protest against the threats to actor Deepika Padukone, who is essaying the titular role in Padmavati. She added, "Sabki dukaan chal rahi hai under the patronage not of the fringe but of the Govt in power. Filmindustry must stand as 1 with #Padmavati." The 48th International Film Festival of India 2017 in Goa will be inaugurated by Shah Rukh Khan tomorrow. The film's release, slated for December 1, could get delayed as the producers will now have to send it back to the board after fixing the "deficiency" in its application. According to board's norms, the censor board can take 61 days for a decision on a film's certification. "When it comes back to us we will put it in queue and see when the turn comes, there will be no exception," the censor board source said. Ajit Andhare, COO, Viacom 18 Motion Pictures, stressed this was "merely a minor technical issue". "Nothing stops them from seeing the film if the want," he told PTI. The film is based on the life of 13th century queen Padmini of Chittor and critics, mostly Rajput groups, say Padmavati wrongly implies a romantic relationship between the queen and Emperor Alauddin Khilji, the all-powerful sultan of Delhi. Sanjay Leela Bhansali has repeatedly denied the allegation and recently released a video clarifying that his film does not distort history. After protests in Rajasthan and many parts of the country, a leader of Karni Sena, which has been at the forefront of the agitation against the film, also threatened Deepika Padukone with physical harm. She was immediately provided a security cover by the Mumbai Police amid escalating protests all over. The group, which initially demanded a preview to vet the film before its release, has now called for an outright ban. It also forced shut the entrance to the Chittorgarh Fort in Rajasthan's Chittorgarh district and called for a nation-wide strike on December 1 to coincide with the film's scheduled release.